IOF has made a library of multi-language resources available for World Osteoporosis Day. 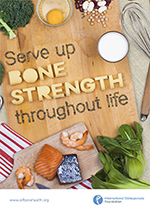 Learn about bone health and the actions you need to take to maintain strong bones and prevent fractures. Read the personal stories of people with osteoporosis from around the world. 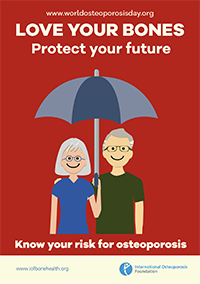 Help spread the word with social media and our multi-language posters. Download & share these resources to help make bone health a priority! Please note that resources made available on the WOD website may be used solely for educational, non-commercial purposes. The information and any downloaded material should not be changed in any way and cannot be used in association with pharmaceutical or commercial products of any nature, or with any type of promotion and advertising, except with prior permission by IOF.